The most versatile and essential of all knives a cook can have is a Japanese chef knife known as a Gyuto knife. Preparing delicious meals starts with taking wholesome ingredients and using the best tools such as a high quality chef knife to make every meal into something special. From dicing, slicing, and chopping fresh produce from a farmers market to carving a roast chicken straight from the oven, even the simplest tasks are elevated with a handcrafted knife that is as beautiful as it is functional. Our Nickel VG-10 Gold Hammered Damascus Gyuto Chef Knife is forged with a Western style curved blade that smoothly rocks back and forth with an extended tip for quick chopping. Forged and hammered with 46 layers of steel in the Damascus tradition with a Nickel VG-10 Gold Core, this knife is complimented with a traditional Japanese style handcrafted Octagonal Shitan Rosewood handle affixed with a Double Redwood bolster. A protective wooden sheath called a Saya encases each knife and adds to its appearance when not in use. The hammered texture of the blade eliminates friction and keeps food from sticking to the blade. Every knife from Yoshihiro is handcrafted by master artisans creating a unique one of a kind work of art. Japanese knives should always be sharpened and honed on premium quality Japanese water stones. 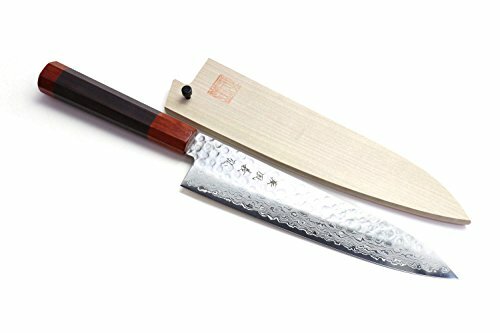 A good quality Japanese water stone not only is the best surface to sharpen and maintain the blade of your knife, but it is also the best tool to preserve and take care of the high quality steel that it is made of.